The Paperback Bookshop in Melbourne’s CBD is celebrating its 50th anniversary in April. 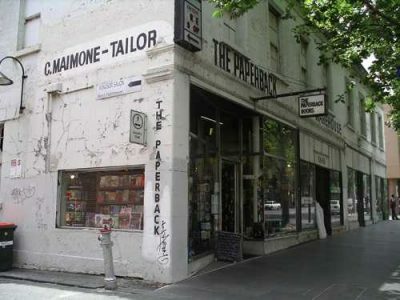 Current co-owner Rosy Morton, who has owned the shop since 2000, said that she’s heard differing accounts of when the shop was founded, but thinks it was either opened in 1968 or 1969, when Pippa Craig set up The Paperback in Melbourne’s CBD. Craig’s idea for the shop was that she wanted to bring in paperback editions from America that weren’t readily available in Australia, including work by the Beat poets. From its beginnings, the shop was open late, and with its location next to Pellegrini’s espresso bar, which brought the first espresso machine to Melbourne in 1954, it became part of the nightlife of the city. ‘I think it was a bit of a hangout joint for people who were into those sorts of books and for people who were in the city at night-time,’ Morton told Books+Publishing. Craig’s daughter Gail Powell ran the shop for some time after Craig’s ownership. Powell’s husband, Alan Powell, was an architect who is said to have designed the shop’s distinctive bookshelves. Morton began working at The Paperback in 1996 and took over ownership of the shop in 2000. Her brother Bill came on board as a co-owner about three years ago. Morton says under her ownership The Paperback has stayed relatively true to Craig’s original vision for the shop. ‘Half of our [stock] is backlist and we still order different stuff from the US that you don’t see around; we do a lot of special orders,’ said Morton. ‘We’ve stayed in the same territory as the shop has always been … but we also like to support new writing as well as backlist,’ she said, adding that the shop likes to ‘stay attuned to some of the small publishers and what they’re doing’. Despite the limited space, the shop is still characterised by a strong sense of community. ‘It’s nice to see that it means something to people, it’s heartening as far as books go,’ said Morton. The shop is celebrating the milestone with a party on 10 April, which will include readings from Christos Tsiolkas and Bella Li. For more information, see the website or the Facebook event.